Have you jumped on the fitbit bandwagon yet? Make that ‘walked’ onto the fitbit bandwagon? The fitbit device is all about walking the walk, counting the steps, each one that you take, whether it’s a daily power walk or the steps you take from couch to kitchen, or the car to the corner store, adding up, little by little, until you reach the desired daily goal of 10,000 steps. 10,000 steps?! That’s a lot of walking. Just under four and a quarter miles a day. Who walks that much as part of your daily routine? Because I don’t. When I got my fitbit back in July I had no intention of meeting that goal. I was already taking a morning walk that I roughly figured at two and a half miles. Two and half miles a day, I thought smugly. That’s plenty. What do you think I am? Athletic? But when I saw both my husband’s sisters sporting fitbits, and when one of them told me she routinely clocks 10,000 steps a day—and she has a desk job—I decided to get on board. You can get all social with it like she does. Hook up with your fitbit friends on Facebook, post your stats and get competitive. Tweet your badges. I don’t do that. I just count my steps which is becoming more and more addictive all by itself. I find myself tapping my device throughout the day, just checking on my step status. Take out the trash: 175 steps. Put the towels away: 27 steps. Upstairs! If I’d sprung for a pricier model I’d get extra credit for that uphill effort. It’s been almost three months and while I’m still not walking 10,000 steps a day, every day—damn that day when I had an early morning dental appointment and missed my walk all together—my average is up to almost 8,000 steps a day. Enough to earn me the London Underground Badge you see atop this page. Truly. The fitbit folks sent me an email a few days ago proclaiming I’d walked 250 miles since signing up in July. The same length as the first Underground Railway which opened in London in 1863. 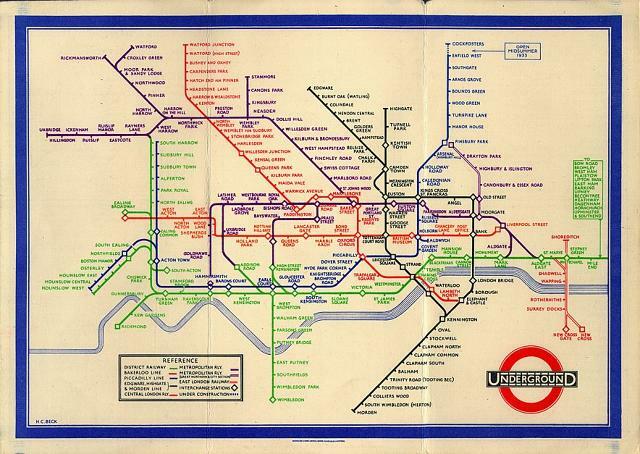 That got me to thinking about walking the actual London Underground route. What would that look like, I wondered. Like this. 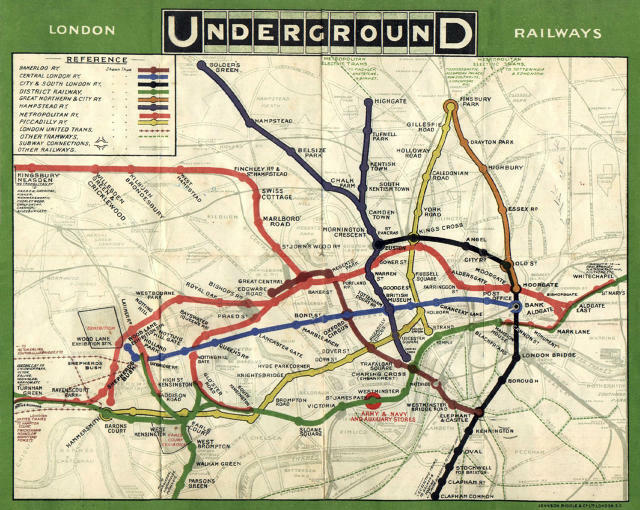 This is the original map of the underground system, published in the UK in 1908. Before then, there actually wasn’t one map that showed all the different lines of service. You’ll probably notice a big difference between this map and the modern day Tube map familiar to Londoners and travelers alike. This first map is geographically correct which is why it’s so messy and muddled looking. It would be another 25 years before the grid-like map to the Tube would come to be, not until 1933 when draftsman Henry Beck realized commuters traveling underground didn’t care about the actual physical locations of all the stops. What was important was that the routes and the stops along the way be clearly defined. Like this. Ta-da! It’s called the Beck map. But where to start? And how? Sadly, I don’t live in England and a walking tour of the London Underground may be on my vacation bucket list but it’s not on hubby’s. So I’ll be taking a virtual walking tour instead, following in my fitbit footsteps, going from place to place in roughly 10,000 steps a day increments. Which is about as far as four point something miles a day takes me. I’m not sure where I’ll begin but every Friday for the foreseeable future I’ll be “walking” the 250 miles of the London Underground and sharing what I discover along the way with you on British Isle Fridays. It may be a drag, a total bore, or who knows, we might make some cool discoveries or a new True Brit friend or two along the way. Which doesn’t help me at all with my real 10,000 steps a day quota. Right now I’m sitting on the couch like a slug watching Rachel Maddow and blogging after being glued to the screen on Pope-Watch all day. I just checked my fitbit and I’m up to 8537 steps today. After Jeopardy, I’ll take a little saunter up to the circle and back. That should do it. If not, I can always take out the garbage again. I’m sharing this post as part of Joy’s British Isles Friday. I manage 8000 steps most days -- 10,000 on days when I get in both a walk and a visit to the supermarket or multiple errands. I love your idea to walk the London Underground. What fun! I'm looking forward to updates of your journey! I've been re-reading my travel journal from a year ago when I was in London. Here's something I learned from a tour called the Lure of the Underground. During World War II people took refuge in the Underground stations during bombing raids. Because of that, Londoners think of the Tube as cozy and safe. That's not an association that other people in the world have with their subways. That’s so interesting Joy and you’re right! Because I’m a Californian, the fear being stuck underground in an earthquake would probably be my first thought...which I would quickly dismiss because you can’t live in fear, but still! I don't do Fitbit so I could be a hopelessly unfit slob. Probably am :) I just enjoy the experience of walking and looking at my world. So do I Jo, there’s always something new to see.